Over the past 20 years or so I've owned several Dakotas. Most were 92-96 models with either the 3.9 V6 or the 5.2 V8. In 2009 I did buy an 04 V6 5 speed for the wife to drive. We sold that 04 this past spring. The 95 and 96 dakota sports with the 5.2 engines ran fairly strong but they could barely hold their own with a stock small block chevy truck from that same era. I've always wanted an R/T model but never was able to find one for sale in my area. That is until this past April when I bought a ratty, but complete, 2001 flame red club cab. The truck was ragged out by some kids before I bought it. 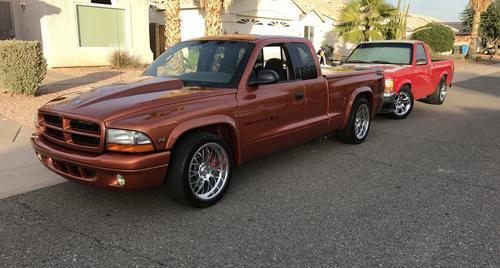 However, they did replace the 5.9 engine with a very low mileage (40k) engine from a wrecked 01 Durango R/T. I'm not sure what mods they did to the engine but that truck is a lot faster than it has a right to be. It is way faster than my other R/T. Fast forward to Aug of 2018. I took a lil trip about 2 1/2 hrs. drive to a town in the neighboring state of Missouri. There I bought one of 414 made in 1999 Club Cab R/T's with Deep Amethyst paint. This truck will be restored. 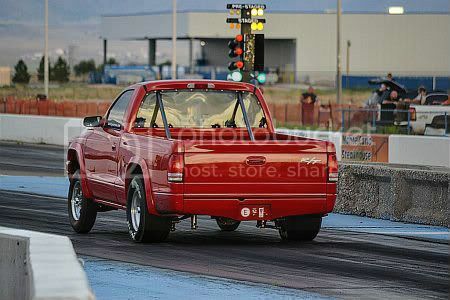 As for the 01 Flame red truck, I'm thinking it just might become a drag truck. Time will tell. Last edited by Rodder204; 08-21-2018 at 02:16 AM. Cut up the purple truck and restore the flame red truck. When I said race truck, I didn't mean I was gonna hack it up. I don't have the money to build a full blown racer....lol. I'm thinking maybe a set of sticky tires, some traction bars and a 125 shot of go juice. I have spent several $ on the red 01 truck already. New radiator, rack and pinion, headlight and taillights, completely rebuilt the front end, tie rods, bushings, ball joints, etc, new brakes and rotors on the front, new brakes for the rear, shocks, headers and a complete exhaust system plus a complete set of used R/T wheels.........The list goes on. I still need to find a bed and tailgate for it as well as new seats and a console. A previous owner also painted the door panels and dash. I'm not sure what I'm gonna do about that yet. The truck has had 2 repaints already and both were poorly done. So needless to say, I still have a lot of work to do on the red truck. I bought the purple truck because, mechanically, it only needs a rack and a power steering pump. It does need paint but the body is straight, so that will be an easy fix. They didn't use the transmission from the Durango R/T I can promise you that, Durango R/T are all AWD which uses the 4wd 46RE. Only way to use the 4wd 46RE in the Dakota R/T would be if they swapped O/D assemblies between the two 46RE transmissions. The 5.9L in the Dakota R/T and Durango R/T are the same, if it feels stronger then they must have done some work to the engine or it just feels that way. slammedR/T.......You may very well be correct about the Durango R/T transmission. I'm not real familiar at all with any details or specs of the Durango R/T. From what I've read and heard, the engines are the same. I assumed the trans were also the same. I just took the guys word that he had swapped both. All I know for certain is there was an 01 Durango R/T with no engine or trans sitting beside the garage the day I bought the truck. There is a lot that I do not yet know about these trucks. Thanks for sharing that bit of info about the trans !!! the 5.9L magnum engine is exactly the same no matter what truck it is in/pulled from, only the jeep 5.9 and 46re is different with the starter on the passenger side and even then the engine it self is the same.